Mayor Jay Gillian announced earlier today that I’ll be taking a job as Ocean City’s new public information officer. Some of you may be wondering how that might affect OCNJ Daily. 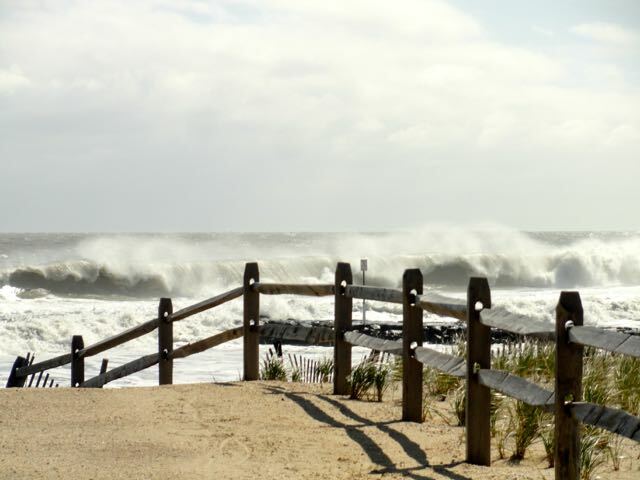 Huge surf generated by days of northeast winds and by distant Hurricane Joaquin hits the coastline of Ocean City in early October 2015. You’ll see new bylines atop news stories and ultimately new ownership, but the Daily will always remain committed to providing responsible, credible and timely news coverage of Ocean City. Tim Zatzariny, a former colleague from Patch.com, will serve as an interim editor. Tim can be reached at tzatz@ocnjdaily.com. A large and loyal audience relies on OCNJ Daily’s reporting, and that won’t change. For me, the new position represents an opportunity to continue to do the work I love in a place I love. I’m looking forward to doing great things. Sign up for free Ocean City news updates. Here you'll find everything you need to know about Ocean City: daily news coverage and comprehensive information on the island's events, businesses and services, attractions, real estate, beach and boardwalk and more. The Boardwalk is the center of their universe when Meghan and Adam Hubley bring their children, Ava, 8, Sadie, 6, and Adelina, 3, on trips to Ocean City from their home in Mullica Hill, N.J. “We like to go on the rides, go in the shops, stop at the pizza place and eat some ice cream,” Meghan Hubley explained of the family-friendly allure of the oceanfront promenade. Down for the Easter weekend, the Hubleys were savoring their getaway at the shore Thursday afternoon with a stroll on the Boardwalk at 12th Street. When asked whether her family would visit Ocean City if the Boardwalk did not exist, Meghan paused for a moment and answered, “Probably not.” Recognizing the Boardwalk’s importance to the summer tourist trade, the city spent about $10 million for a multiyear reconstruction that included a new wood deck, substructure, ramps, pavilions and railings from Fifth to 12th streets. The facelift was done in increments during the off-season each year and was completed in 2018.